Food is made up of not only protein, carbohydrates, fats, fiber, vitamins, and minerals, but also critically important enzymes. All living things contain enzymes and life cannot exist without them. Enzymatic activity is involved in every biochemical reaction in the body. Enzymes are essential nutrients and can easily become deficient in the body. Think of enzymes as the “workers” on a construction site. Proteins, carbohydrates, fats, vitamins and minerals are the raw materials but the workers are the ones needed to build the house. 1. Digestive Enzymes – secreted by the salivary glands, stomach, pancreas, and the small intestine. They break down foods to their simplest forms. 2. Food Enzymes – exist naturally in raw food. Temperatures above 118 degrees F destroy enzymes. They work to digest food so it can be absorbed into the blood stream. Food enzymes are found in raw fruits, vegetables, eggs, raw unpasteurized dairy, meat and fish. 3. Metabolic Enzymes – produced in the cells and can be found in organs, bones, blood, and inside the cells. These enzymes assist the function of the organs. You will not see enzymes listed on the US RDA’s but they are extremely important. Where vitamin and mineral deficiencies can result in outward symptoms, enzyme deficiencies can be happening behind the scenes undetected and eventually manifest as chronic degenerative diseases. Although it is widely known that enzymes are critically important, this fact is completely ignored when it comes to food manufacturing and processing. In the early 1900’s there was a shift from rural and agricultural food to industrial, processed food. In order for food to have a longer shelf-life in a can or a box, enzymes had to be removed. If they are not removed, they will ultimately digest the food as it sits in a can. Then…Food manufacturers used to use salicylic acid (aspirin) to destroy enzymes but there were many health ramifications to doing this. Salicylic acid was linked to blood thinning, irritating effect on the kidneys and bowels and slowed digestion. deficiencies and health consequences. When enzymes are destroyed, it taxes your body tremendously. Digestion begins with your saliva as it secretes enzymes to start working on the food right away (that is why it is so important to chew your food). If the food also contains enzymes, they also go to work here. The food goes into the upper part of the stomach where it takes approximately 30-60 minutes for your stomach to produce enough acid to bring the pH from a 5.0-6.0 to a 3.0 where it can work on the food you ate. In the meantime, enzymes start working right away and are able to pre-digest food in the stomach. It is estimated that enzymes can allow up to 60% of starch, 30% of protein, and 10% of fat to be pre-digested. That is significant! The predigested food moves into the intestine where hormonal signals go out to the pancreas to let it know how much protein, fat, and carbohydrate remain to be digested. The pancreas produces the precise amount of enzymes needed to do the job. This is a fragile process and predigestion is critically important. Protease & Peptidase – found in meats, eggs, milk, cheese, wheat , peanuts. hydrolyze proteins breaking them down into usable forms. They are absorbed into the blood where they can have a positive effect on immune function, dissolving blood clots, and helping bloodflow. 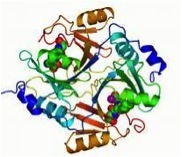 Lipase – found in avocados, olives, nuts/seeds, bananas, cherries, grapes. Hydrolyzes fats and is linked to treat pancreatic cancer, as therapy after a heart attack, and to control cholesterol and triglycerides. Amylase – hydrolyzes carbohydrates – the hardest for the body to digest. Temperatures above 118 degrees F destroy enzymes found in food. Therefore, eating raw foods and/or using a dehydrator set at 118 degrees or below ensures proper enzymatic intake. Note: most produce is covered with a layer of cellulose which is not broken down by the body. This is what most commonly causes gas and discomfort when eating raw produce. The most common way to combat this problem is to cook the food which removes the cellulose but another way to do it is to chew food thoroughly which also removes the cellulose without destroying the enzymes. When food particles are not digested properly, they pass through the gut wall where the will start to putrefy and become toxic. These toxins eventually make their way to the blood. Food that is not broken down properly and that don’t make it across the gut wall will remain in the intestines where unfriendly bacteria will begin to feed on the undigested food. (this can also occur when protein and refined carbs are consumed at the same time). This causes irritation to the lining of the colon which leads to a host of other problems. Improves digestion, slows aging (including wrinkles), disease prevention, immune booster, reduces inflammation, prevents allergic reactions, speeds healing, etc.